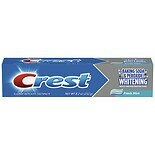 Shop Colgate Baking Soda and Peroxide Whitening Toothpaste Brisk Mint (6 oz. )6 oz. $249$2 and 49 cents$0.42 / oz. 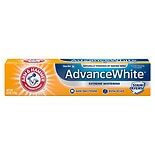 Shop Arm & Hammer Advance White Extreme Whitening Control with Baking Soda & Peroxide, Stain Defense Mint (6 oz. )6 oz. $459$4 and 59 cents$0.77 / oz. 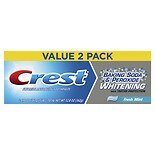 Shop Crest Baking Soda & Peroxide Whitening with Tartar Protection Toothpaste Fresh Mint (8.2 oz. )8.2 oz. $429$4 and 29 cents$0.52 / oz. 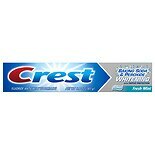 Shop Crest Baking Soda and Peroxide Whitening with Tartar Protection Toothpaste Fresh Mint (6.4 oz. )6.4 oz. $249$2 and 49 cents$0.39 / oz. Choosing the best kind of toothpaste for your needs can seem an inconsequential task, yet your decision can actually make a big difference in the quality of your personal oral care. The proper toothpaste is an absolutely vital and key component to dental hygiene, of course, and it's worth investing some time and effort into researching your many options. 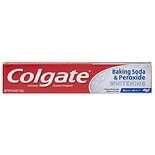 Among its impressively varied stock of top-shelf toothpastes, Walgreens includes a rich collection of formulations anchored by baking soda, a natural ingredient (sodium carbonate) that confers both chemical and abrasive action in the fight against stains and plaque. The abrasiveness of baking soda is a notable characteristic: Because the compound's crystals dissolve readily in water, they can operate in particularly out-of-the-way nooks and crannies of your dentition. As effective as they are, those crystals aren't as roughly abrasive as some other chemicals found in traditional toothpastes, so baking-soda formulations often work out well for those who react sensitively to other pastes. That same quality also means baking soda can be effective at scrubbing away surficial tooth discolorations without damaging the enamel itself. It's worth repeating that selecting a toothpaste isn't as difficult as it seems: Remember, you'll be brushing at least twice a day with this concoction, trusting your precious, hard-working, one-of-a-kind chompers to its action. Whether you're one for whom many toothpastes are too irritating or are simply interested in products with natural ingredients, baking-soda toothpastes are certainly worth considering. The Walgreens options are richly annotated with general product descriptions and ingredient breakdowns, as well as informative customer reviews submitted by those with firsthand experience. Toothpastes mixed with baking soda can sometimes do a number on those surface-layer stains your teeth tend to accumulate through daily processing of food and beverages, rendering some whitening benefit. In general, they're essential for clearing your teeth of food particles and eliminating the bacterial accumulations of plaque and tartar, which can cause potentially serious periodontal disease. Come check out the baking-soda toothpaste options at Walgreens, and ensure you're using only the finest tools in your daily quest for a healthy, happy mouth.